Director – Matthew Robbins, Screenplay – Matthew Robbins & Hal Barwood, Producer/Mechanical Effects Supervisor – Danny Lee, Photography – Derek Vanlint, Music – Alex North, Visual Effects – Industrial Light and Magic (Supervisor – Brian Johnson), Stop Motion Animation – Jon Berg & Phil Tippet, Dragon Design – David Burnett, Ken Ralston, Phil Tippett & Chris Walas, Production Design – Elliott Scott. Production Company – Disney/Paramount. A delegation from the kingdom of Urland come to Castle Cragamore to beg the wizard Ulrich’s help in killing the dragon Vermithrax Perjorative that terrorises their land. The king has drawn a truce with the dragon – in return for it sparing the land, he draws a lottery from among the virgins of the land and chooses one for the dragon to devour. The king’s guard then arrives to stop the quest and its captain kills Ulrich. Ulrich’s apprentice Galen Brandwardyn joins the villagers as they return to Urland. With little skill at magic, Galen attempts to destroy the dragon on his own. Outside of animation, there have been few successful flights into high fantasy in the cinema – Ray Harryhausen’s Sinbad films, the first two Thieves of Baghdad, John Boorman’s Excalibur (1981), Peter Jackson’s The Lord of the Rings trilogy, maybe Ladyhawke (1985) and Conan the Barbarian (1982). Certainly up until the mid-1980s, fantasy never developed its own genre on the screen, despite enjoying its greatest popularity ever in the publishing field, with booksellers shelves overflowing with endless 28 volume trilogies. Maybe it is that cinema and tv is unable to represent the wide-open sense of place (and the endless maps that constitute fantasy kingdoms) that is apparently necessary to fantasy. Of course, that changed with the 1990s attempts to copy Hercules: The Legendary Journeys (1994-9) and Xena: Warrior Princess (1995-2001), not to mention the post-Lord of the Rings boom in the 00s. Dragonslayer is however one of those rare successes. (Although, as per fantasy’s reception in the visual media, the film was a box-office failure). The spirit of Star Wars (1977) stands unmistakably over Dragonslayer – the youthful hero off to confront destiny; and particularly in the character of Ralph Richardson’s wizard who is killed but lives on – however the issue is less one of imitation than two films attuned to similar mythic archetypes. The film offers a wonderful portrait of the Middle Ages – this is not the romanticised spectacle of sundry historical epics or Prince Valiant et al, but something dark and gritty. Dragonslayer was shot on location in Wales, which lends its unmistakable landscape of black rock and gloomily imposing mist-covered moors to magnificent effect. The photography is stunning, getting right down inside the primal rawness of the Middle Ages – Ulrich’s castle all lit in beautiful golden flames, the journey back to Urland across a bare but beautifully rich, verdant greensward. Alex North also contributes a wonderful brass score. The cast all give uniformly excellent performances – there is never a single performance that lets the film down. Peter MacNicol, the regular from Ally McBeal (1997-2002) in his screen debut, is convincingly brash and over-confident as Galen, although his anachronistic American accent intrudes. Ralph Richardson rises magnificently to the part as the wizard Ulrich with just the right balance of humour, crankiness and dignity. 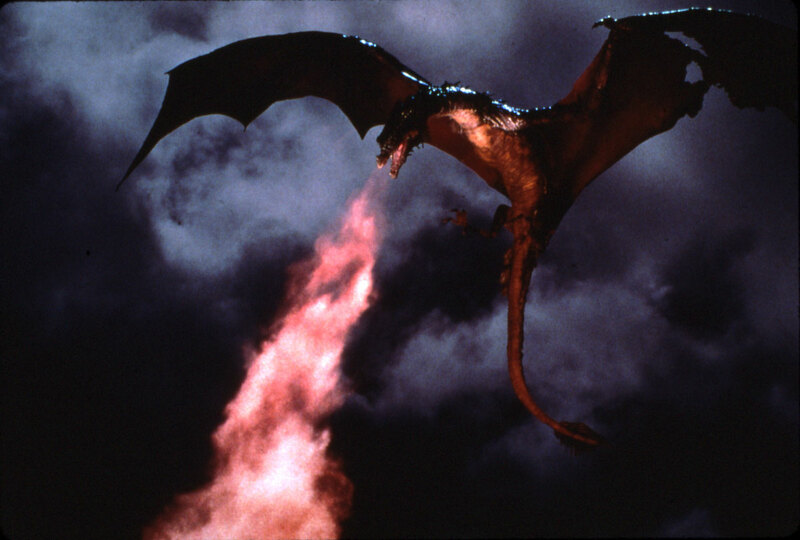 Matthew Robbins spends nearly two-thirds of the film building towards the unveiling of the dragon and when finally seen it looks magnificent. There is a scene where Peter MacNicol goes into the cave to confront the dragon that is absolutely enthralling. The final climax with Ralph Richardson taking on the flying dragon is great, although the somewhat Star Wars-derived flying effects never quite equal the scarily mismatched scale of the earlier scene pitching of the vulnerable hero against the power of the dragon. (Indeed, it is a climax that never even gives a satisfactory opportunity for the hero of the piece to be the hero). 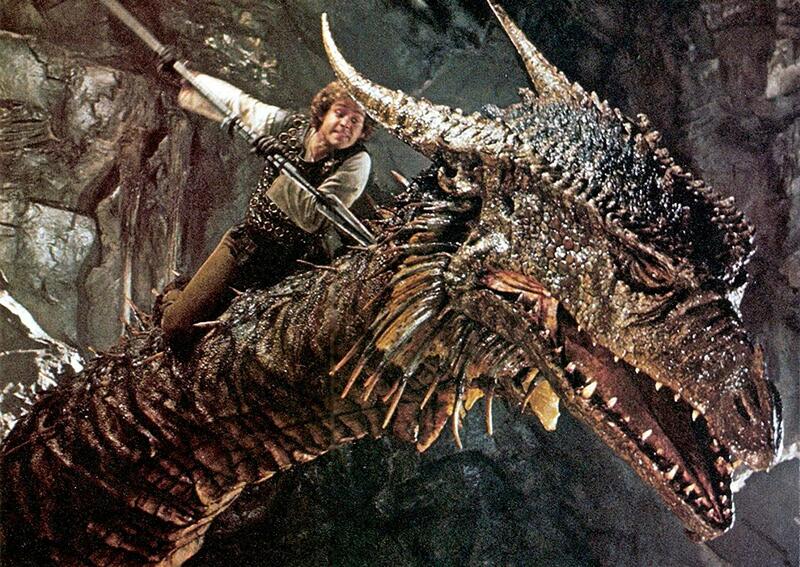 Industrial Light and Magic succeed in creating the finest screen dragon ever up to that point. They used a process they devised for the film known as Go-Motion, a variation on stop-motion animation wherein the animated model makes several moves within a frame lending to a more fluid movement, rather than in traditional stop-motion where a model only moves once, lending to the familiar jerky gait of stop-motion animated creatures. It was a move that forever put traditional stop-motion in its grave – something that was reinforced by Ray Harryhausen’s last film Clash of the Titans (1981) that was released two weeks earlier the same year, which, when seen up against Dragonslayer, looked disappointingly wooden. The writing-directing team of Matthew Robbins and Hal Barwood have made a number of other genre entries, including the zombie film Warning Sign (1985) and the cute UFO film Batteries Not Included (1987). Barwood and Robbins began writing scripts including Spielberg’s second film The Sugarland Express (1974) and MacArthur (1977) and also directed the likes of Corvette Summer (1978) and The Legend of Billie Jean (1980). In more recent years, Robbins has solo written the script for the Guillermo Del Toro films Mimic (1997), Don’t Be Afraid of the Dark (2011) and Crimson Peak (2015). Hal Barwood now writes and directs Lucasfilm computer games.